In the last meeting of the OH! Origami Houston group, we had a visitor that was interested in learning an origami rose. The name of Toshikazu Kawasaki immediately popped up in the conversation, as he had designed the most famous and exquisite origami roses. Rose (top left, white), folded from a 6" (150 mm) square of thin washi paper. This rose starts with a square grid. The diagram is in the book Origami for the Connoisseur . Rose bud (top left, red, the smaller one), folded from a 6" (150 mm) square of duo kami paper. This rose starts with a square grid. The diagram is in the book Roses, Origami and Math, and in the book The Greatest Dream Origami (ISBN 9784255005058). One minute rose (top left, red, the bigger one), folded from a 6" (150 mm) square of thin washi paper. This rose can be folded from a template, that is available in the book The Greatest Dream Origami (ISBN 9784255005058). Rose (top right, pink), folded from a 9" (225 mm) square of Pacon Paper Squares (very thin and strong paper, nice to fold!). This rose starts with a 22.5 degree diagonal grid. 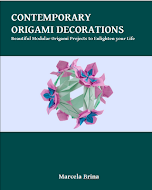 The diagram is in the book Roses, Origami and Math , and in the book The Greatest Dream Origami (ISBN 9784255005058). Leaves (top right), folded from a 6" (150 mm) square of thin washi paper. The diagram is in the book Roses, Origami and Math , and in the book The Greatest Dream Origami (ISBN 9784255005058). Crystal roses (bottom left, pink), folded from a 9" (225 mm) square of Pacon Paper Squares . The four buds are folded from a single sheet of paper. The model starts with a square grid. I tied the model with a ribbon to help keep it together. The diagram is in the book The Greatest Dream Origami (ISBN 9784255005058). 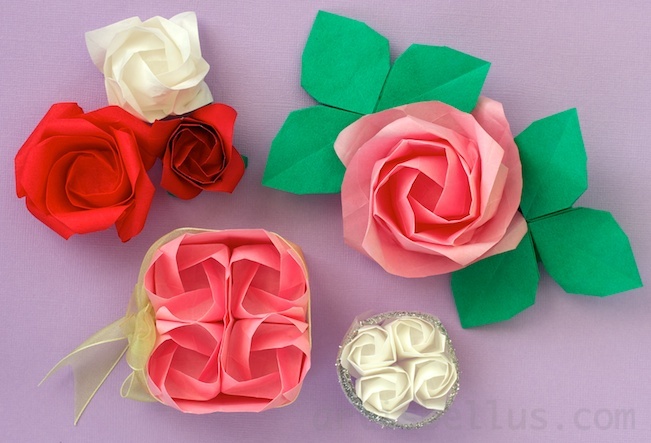 Bridal roses (bottom right, white), folded from a 9" (225 mm) square of Pacon Paper Squares . 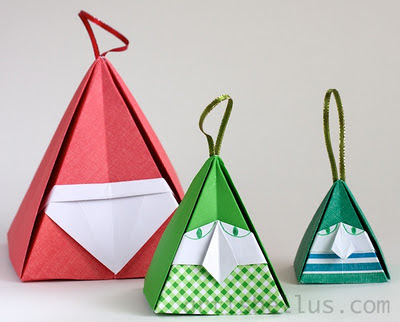 The four buds are folded from a single sheet of paper. The model starts with a diagonal grid that is cut from a square grid. I tied the model with a ribbon to help keep it together. The diagram is in the book The Greatest Dream Origami (ISBN 9784255005058). Beautiful collection! Thanks for all the details about the paper and diagrams. I've got Greatest Dream & Connoisseur (and Pacon paper, too :)). I have yet to try the Crystal and Bridal roses. Your blog and designs are great! The roses are beautful. Recently, I folded a Kawasaki rose too. I got the instructions from You Tube.